Even as temperatures climb, daylight extends and the promise of Spring lingers around the corner, the United States is still facing the threat of the flu. 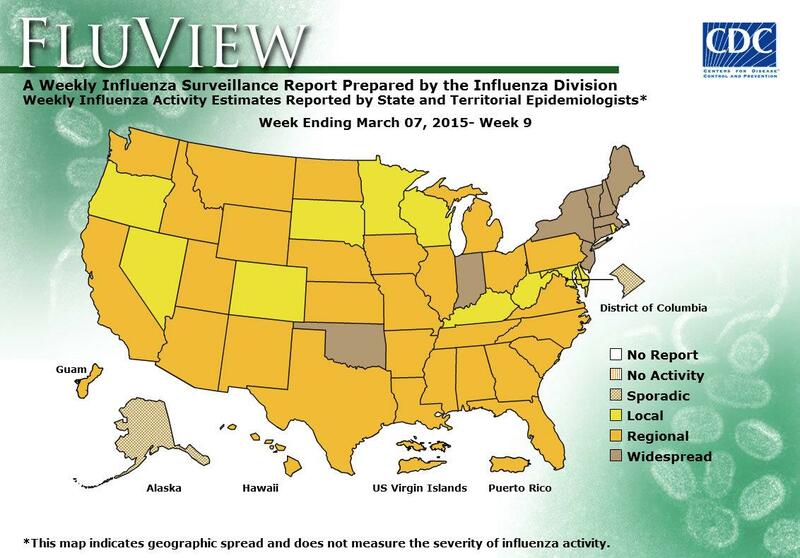 While influenza activity has begun to decline across the United States in recent weeks, the CDC’s influenza surveillance systems still show elevated activity as we enter the month of March. Although the average length of a flu season for the past 13 seasons has been 13 weeks, flu activity has been elevated this season for 16 consecutive weeks so far. As of March 7, 2015 there were still 9 states reporting widespread activity, 29 states reporting regional activity and 11 states reporting local activity. Even though the season started early this year, it is expected to continue for several more weeks and we can already see that it has been dangerous, deadly and unpredictable this season. As of February 21, 2015, the proportion of deaths attributed to pneumonia and influenza remains above the epidemic threshold and has exceeded that threshold for eight consecutive weeks. Additionally, seven children have died of influenza between March 1-7, 2015, bringing the total number of flu-associated pediatric deaths reported so far this season to 104. While it’s true that the majority of individuals who suffer with the flu will survive, the CDC also monitors hospitalizations that are associated with influenza infection. So far this season the most affected age group has been adults 65 years of age and older, and they’ve accounted for more than 60% of reported influenza-associated hospitalizations. This supports the need for wide-spread vaccination among older individuals and their caregivers, to include nursing home employees and health care workers. As of February, 21, 2015, the most commonly reported underlying medical conditions among hospitalized adults were cardiovascular disease, metabolic disorders, and obesity. Children, especially those under 5 years of age, have the second-highest hospitalization rate this season, with the most commonly reported underlying medical conditions to be asthma, neurologic disorders, and immune suppression. Among hospitalized women of childbearing age, 26% were pregnant. However, while certain medical conditions can increase your risk of complications from influenza, seven percent of adults and 39% of hospitalized children had no identified underlying medical conditions, illustrating the fact that flu can be life-threatening even to a previously healthy individual. Flu season started early in October and it wasn’t long before we were seeing wide-spread flu activity across the country. One major concern that was identified earlier this season was the predominance of a circulating Influenza A (H3N2) virus that had drifted from the influenza A (H3N2) component included in this year’s vaccines. Despite the concern that this drifted strain may reduce the overall measured effectiveness of this year’s flu vaccine, vaccination was still encouraged to help reduce the severity of illness in these cases and protect against other strains. Additionally, the CDC noted that it was possible that other flu strains may become more prevalent later in the season and therefore vaccine could be effective in preventing illness from those strains. Now that we are 16 weeks into the season, we now know that 80% of the circulating H3N2 viruses this season were determined to be drifted viruses. However, in the past few weeks there has been a shift in the data that indicates that 52% of all influenza positive specimens reported in the week ending March 7th were influenza B viruses. Again, proving that the flu can be very unpredictable, even this late in the season. It’s common for people to make flu vaccination choices based on their personal experiences with the flu. In other words, those individuals who have never suffered with the flu often don’t feel the need to be vaccinated because they fail to identify with the risk and can mistakenly believe the flu is not that serious of a condition. On the other hand, people who have had personal experiences with the flu, either caring for someone who has been ill or suffering themselves, are more likely to want to take precautions to prevent the flu in the future. In the case of Gigi, a teacher who believed she was immune to every possible illness as a result of exposure in the classroom over the years, the flu almost took her life. She shared her story on Shot By Shot and admitted that she never thought something so devastating could happen to her. Though Gigi’s story comes late in the season, each and every story is a reminder of just how unpredictable the flu can be. Regardless of your age or health conditions, influenza can result in a prolonged illness or hospitalization. Sadly, in the case of 104 children, influenza has been responsible for their death. While no vaccination is 100 percent effective, flu vaccination can make a difference in preventing flu or reducing the severity of the flu. Next season, get your flu vaccination early for the best chance of prevention. Not only will you be protecting yourself, but you will be helping to reduce flu transmission to others in the community who are at high-risk of flu complications such as the young and the elderly. But don’t forget about Gigi, and the fact that flu can be devastating to a healthy person of any age. The CDC is already taking steps to ensure that the next Influenza vaccine is more effective – though it also highlights how difficult a virus that is & why it isn’t something to take lightly. When one says the current vaccine is only 20% effective, it does not mean “ineffective.” Since one of the three strains that the vaccine protects against mutated, the match is not perfect; however, if it doesn’t completely protect against that strain, it will still lessen the symptoms and the match for the other two strains is still quite good, so protection is good as well. Our mass media has done a poor job of explaining this.